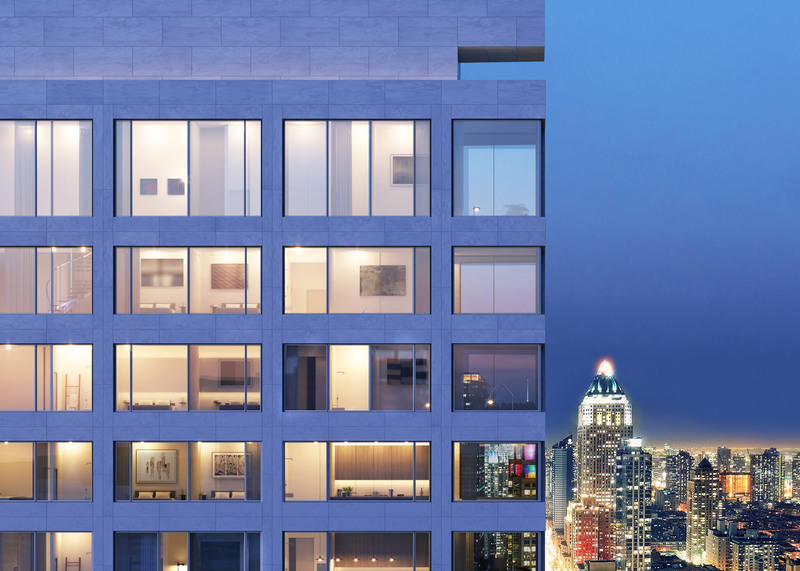 An image of Portuguese architect Álvaro Siza's first US project – an upscale residential tower in Manhattan – has been released, with construction slated to begin this May. Called 611 West 56th Street, the 35-storey building will rise over 420 feet (128 metres). It will be constructed on New York's West Side, near the corner of 11th Avenue and 56th Street, and will be located next to Via 57 – the tetrahedron-shaped tower by BIG that is nearing completion. The 82-year-old Siza was commissioned to design the residential tower last year, as Dezeen reported. Construction is expected to begin this May, with completion slated for the fall of 2018. Encompassing 162,000 square feet (15,050 square metres), the tower will contain approximately 80 residential units, ranging from one to four bedrooms and expansive penthouses. The architects Michael Gabellini and Kimberly Sheppard, founders of New York-based Gabellini Sheppard, will collaborate with Siza on the building's interiors, and SLCE Architects will serve as the architect of record. The high-end building will offer a roof garden, sun deck and several private terraces. Other amenities include a private swimming pool, spa and fitness centre, children's playroom, screening room and areas for entertaining guests. The project is being backed by Sumaida + Khurana and LENY, real estate firms that specialise in luxury developments. Sumaida + Khurana recently launched sales for 152 Elizabeth Street, the first building in New York by Japanese architect Tadao Ando. "Álvaro Siza is a legendary master architect, having designed many of the world's most iconic buildings over the last half century," said Amit Khurana, founding partner of Sumaida + Khurana, in a statement. "We believe that this will be a seminal project that captures the elegance and profound subtlety that is at the heart of his work." The building is just one of several recent housing projects in New York by high-profile architects. Residential towers by Renzo Piano and David Chipperfield have been unveiled in recent months, and work is progressing on a skinny residential skyscraper by Norman Foster. A supertall tower by Rafael Viñoly – the tallest residential building in the western hemisphere – is slated to open this year. In an Opinion piece for Dezeen, architect Steven Holl said that "architecture with a sense of social purpose is becoming increasingly rare". Dezeen columnist Aaron Betsky also said that New York is being transformed into a Capitalist holy land with no space for the poor. Rendering is by Noë & Associates with The Boundary. Photograph is by FG+SG – Fotografia de Arquitectura.